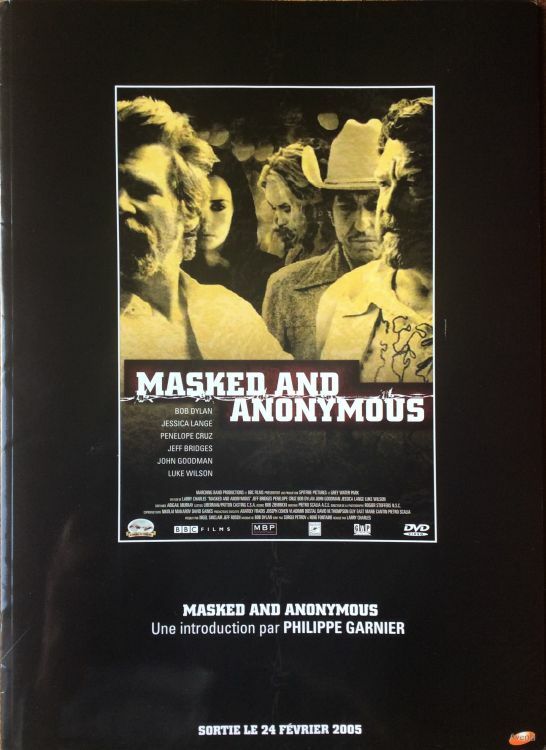 MASKED AND ANONYMOUS is a 2003 drama film directed by Larry Charles. 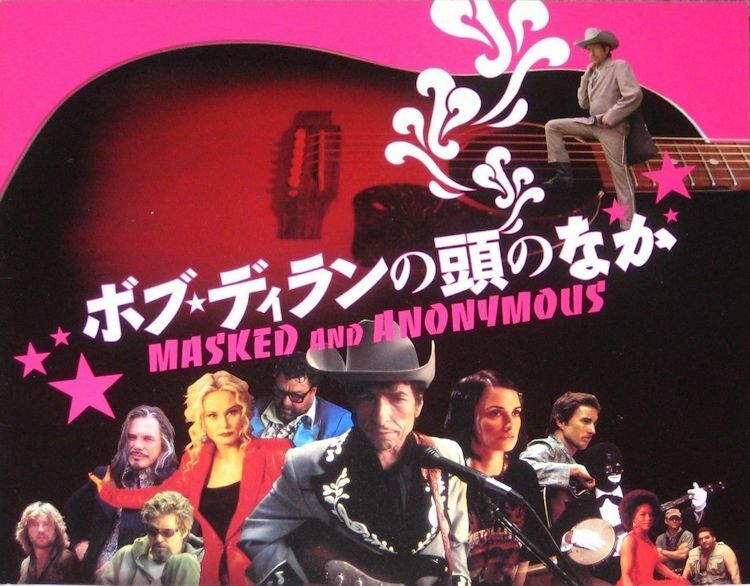 The film was written by Larry Charles and Bob Dylan, the latter under the pseudonym "Sergei Petrov". It stars Dylan alongside a star-heavy cast, including John Goodman, Jeff Bridges, Penelope Cruz, Val Kilmer, Mickey Rourke, Jessica Lange, Luke Wilson, Angela Bassett, Bruce Dern, Cheech Marin, Ed Harris, Chris Penn, Steven Bauer, Giovanni Ribisi, Michael Paul Chan, Christian Slater and Fred Ward. In some ways, the film is political: it describes how Fate sees the political landscape (people fighting for no reason, a nation without hope, governments that cannot be trusted) but at the same time Fate makes it clear that he "was always a singer and maybe no more than that". He produces no solutions to any of the problems the film presents. Rather, he makes it clear that he "stopped trying to figure everything out a long time ago." (Wikipedia). French press document, 11 pages on glossy paper, about the film, the actors and characters. Thank you to Jean-Pierre Mercier. 2005, Xanadu Japan, strictly official Japan film programme book (12 pages , 21cm x 25.5 cm Size) with ticket stub.